I’ve covered many iterations of the popular Zebra F-301 pen on this blog, and it’s been quite a hodgepodge. For example, there’s the F-301 Compact, a redesign that managed to be even more uncomfortable than the original. There’s also the rollerball version of the F-301, creatively named the R-301, which made some positive and interesting changes, yet still failed at some of the basics. And then there’s the 301A, a version of the F-301 that made almost no changes, positive or negative, except that the barrel looks a little prettier. But, finally, I’m happy to report that Zebra has an update of the F-301, called the F-301 Ultra, which really is a marked improvement. 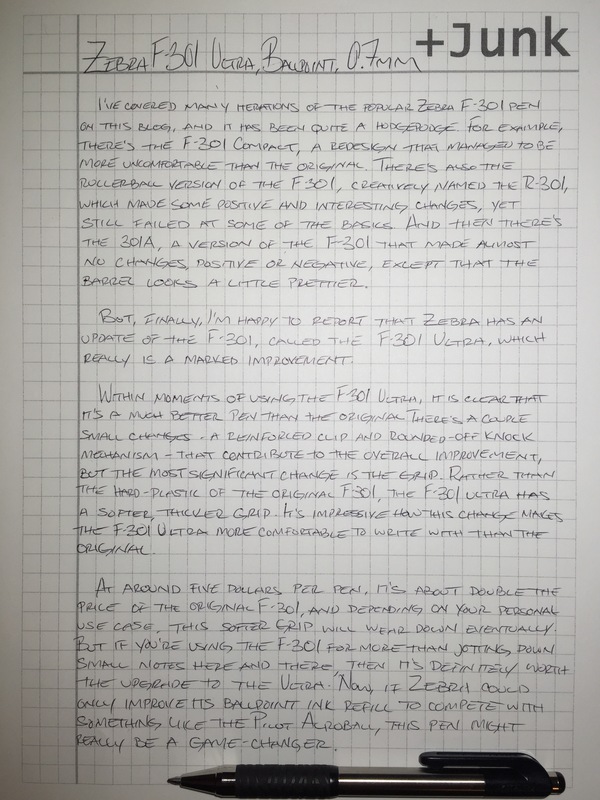 Within moments of using the F-301 Ultra, it’s clear that it is a much better pen than the original. There’s a couple small changes – a reinforced clip and a rounded-off knock mechanism – that contribute the overall improvement, but the most significant change is the grip. Rather than the hard-plastic of the original F-301, the F-301 Ultra has a softer, thicker grip. It’s impressive how this change makes the F-301 Ultra much more comfortable to write with than the original. 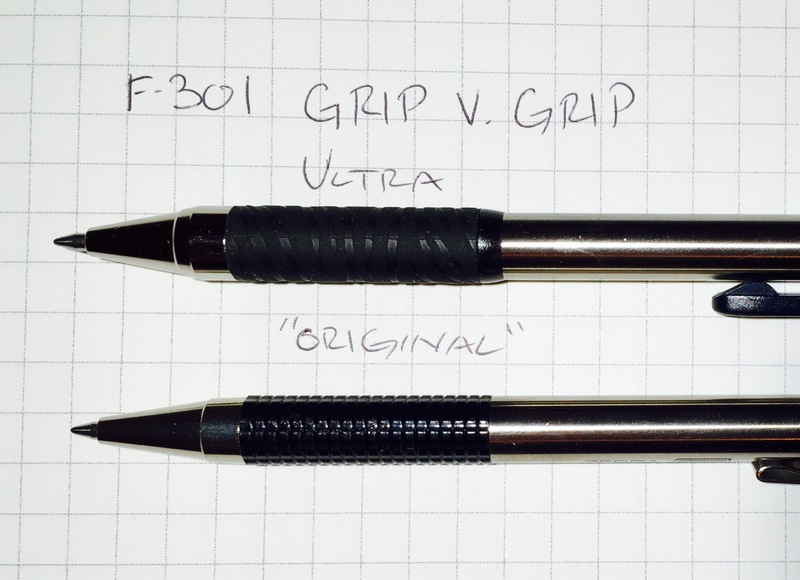 At around five dollars per pen, it’s about double the price of the original F-301, and depending on your personal use case, this softer grip will wear down eventually. But if you’re using your F-301 for more than jotting small notes here and there , then it’s definitely worth the upgrade to the Ultra. Now if Zebra could only improve its ballpoint ink refill to compete with something like the Pilot Acroball, this pen might really be a game-changer. A review from the Tiger Pens Blog. Apparently, it’s a good self-defense pen? I don’t know about that, but he also agrees that the ink is less than ideal. A review on the Fountain Pen Network Forum by member s5s. Again, the main contention is the refill, which is a proprietary design. So don’t think you’ll be able to switch this refill out with any other. The F-301 Ultra is carried by many retailers online, but I’ve never seen one in a store – even Zebra’s website doesn’t really mention the Ultra anywhere. Perhaps it has been discontinued already. Any further luck finding these? They’ve been my favourite pen for some time (potentially 10 years) but I’m down to my last one. You should be able to just replace the refill – Zebra sells those separately. Or are the pens just wearing out over time? Well they are not wearing out but I would like to buy extra full pens (as well as refils). As nice as they are, they are not worth $30-40 being asked on Amazon and eBay.